An unusually lengthy warm season in the interior Columbia Basin, combined with low water volumes, has apparently given, first sockeye salmon and then fall chinook salmon, reason to pause before they jump an eighth and final hydro hurdle -- the lower Snake River's Lower Granite Dam-- on their spawning journey. Through Thursday a total of 8,090 fall chinook had been counted passing over Little Goose Dam, the seventh dam in the fishes' path, located about 37 river miles downstream of Lower Granite. The total passage at Lower Granite is 2,983, which considered low since the fish can on average swim from one dam to the other in as little as three days. The past three days has caused dam and salmon managers to look for solutions. Daily counts at Lower Granite had totaled 200 or better for the previous week before dropping to minus 6 on Tuesday -- more fish were counted heading downstream at the fish ladder than were counted surging upstream. That was presumably because fish were finding temperatures in the fish ladder and in the dam's forebay (the reservoir above) warmer than desirable for their cold water tastes. "I think the answer is the weather," the U.S. Army Corps of Engineer's Ann Setter said of the reason why the sockeye in August and fall chinook this week apparently viewed the Lower Granite fish ladder with some trepidation, something rarely noted in past years. The summer season in southeast Washington arrived early, and has stayed late. Cool water drawn from the North Fork of the Clearwater River's Dworshak Dam reservoir has served its purpose well this summer, allowing for the maintenance of water temperatures below Lower Granite, in the tailrace, at 68 degrees or less for the most part, according to the Corps' Steve Hall. Cool water generally sinks to the reservoir's lower strata and thus flows through power generation turbines. That 68 degree standard is considered to be the higher end of salmon health and comfort thresholds. The Clearwater feeds into the Snake just upstream of the head of Lower Granite Reservoir. It mixes with much warmer water from the upper Snake. Early this week high winds served to stir Lower Granite's reservoir, eliminating the cool water-warm water stratification in the top 30 feet. That "turning" of the reservoir likely contributed to a warming of the water flushed through the fish ladder, and posed a less inviting exit environment. Auxiliary pumps have been employed since mid-August in an attempt to flush cooler water from depth down the fish ladders. But the warm-cool water mixing reduced the ability, at least for a time, to tap that cooler water. "It still is warm," Hall said Wednesday of of ladder water temperatures that rose as high as 71 degrees at midweek, and temperatures that ranged from 69.5 to 72 degrees in the forebay down to 30 feet. One hope is that cooler, wetter weather forecast for the immediate future will provide better conditions in the reservoir. "That will definitely bring temperatures down," Hall said. Meanwhile dam operations were implemented after a Wednesday meeting of the Technical Management Team (fish/hydro managers) to emphasize early-day operations of hydro units 2-3, which had seemed in earlier implementation to improve hydraulic conditions below the dam to allow improved salmon entrance to the fish ladder. Past studies show that adult fall chinook are most likely to make their up-ladder surge with first light. Setter said the same operational strategy was employed last month and seemed to initiate passage of a Snake River sockeye run that too seemed to have stalled. Unit 1, the closest to the ladders, is out of service for maintenance. This week, the dam counts improved from minus 6 on Tuesday, to 83 on Wednesday and then 287 on Thursday. Both the sockeye, which are listed as endangered under the federal Endangered Species Act, and the Snake River fall chinook, are the focus of costly recovery efforts. 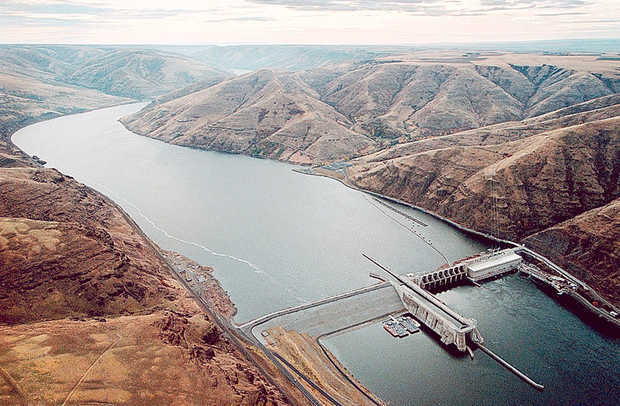 The preseason forecast developed by the Technical Advisory Team was for a return of 31,600 Snake River wild fall chinook to the mouth of the Columbia River, which is 272 percent the 2003-2012 average, and the highest return on record (since construction of the lower Snake River dams was completed in 1975).